Every Sunday, “Christians” gather the family together, go to a church, sing, pray, often participate in responsive readings, give an offering, listen to a sermon by the pastor and after an hour or so, go home, believing they have worshiped God in the Biblical way. But when Jesus came to earth and died on the cross, the Temple curtain was ripped from top to bottom signifying that the ritual of human priestly mediation between God and man was OVER! From then on, we were to approach Jesus directly, one on one, without any human intermediary. In the Upper Room, God poured out His Spirit on those present to demonstrate his desire and ability to empower all who develop a close relationship with Him by Him coming to live within them. By looking to the Lord Jesus within, we become changed. (2 Cor 3:18) By reading His Word, by being in constant communication with God and enjoying His love, by looking constantly at the life of the Lord Jesus in Scripture, by His power, we will become like Him and we will exhibit His Spirit and character. As startling as it may sound, most everything that is done in our modern churches has no basis in the Bible. As pastors roar from their pulpits about being ‘Biblical’ and following the ‘pure Word of God,’ their words betray them. Alarmingly, precious little that is observed today in modern Christianity demonstrates anything found in the first-century church. Shockingly, most of what is done for ‘church’ was lifted directly out of pagan culture in the post-apostolic period. If you are a Christian in the institutional church who takes the New Testament seriously, what you are about to read will force you to have a crisis of conscience because you will be confronted by irresistible historical fact. On the other hand, if you happen to be one of those rare breeds who gathers with other Christians outside of the organized churches, you will discover afresh that not only is Scripture on your side—but history stands with you as well. With some minor rearrangements, almost 350 million Christians around the world observe this liturgy week after week. The Christian church today agrees with Luther’s belief in the centrality of preaching, “yet it has no Biblical precedent whatsoever.” Luther’s liturgy varied little from the Catholic Mass, and in the end was nothing more than a truncated version of it. Under Luther’s influence, the Protestant pastor simply replaced the Catholic priest. It is a cultivated form of speech, possessing a specific structure. It typically contains an introduction, three to five points, and a conclusion. They spoke extemporaneously and out of a present burden, rather than from a set script. Where did the “sermon” come from? The Christian sermon was borrowed straight from the pagan pool of Greek culture. In the fifth century B.C. a group of wandering teachers called sophists invented rhetoric (the art of persuasive speaking). “They recruited disciples and demanded payment for delivering their orations. The sophists were expert debaters. They were masters at using emotional appeals, physical appearance, and clever language to ‘sell’ their arguments”. As organization of the church increased, there came a gradual restriction of the liberty of addressing the community, to the official class. Eventually, only those who were trained were allowed to address the assembly and the clergy-laity distinction began widening at breakneck speed. One scholar has said, “The greatness of the orator took the place of the astounding event of Jesus Christ. And the dialogue between speaker and listener faded into a monologue.” (Wayne E. Oates, Protestant Pastoral Counseling (Philadelphia: Westminster Press). In a short: The Greco-Roman sermon replaced prophesying, open sharing, and Spirit-inspired teaching. As early as the third century, Christians called their sermons by the same name that Greek orators called their discourses. They called them homilies. Today, one can take a seminary course called homiletics to learn how to preach. The influence of Greek Ideas, p. 109 Yngve Brilioth, A Brief History of Preaching, (Philadelphia: Fortress Press, 1065). Sermonizing harms the church because it is a one-way affair. 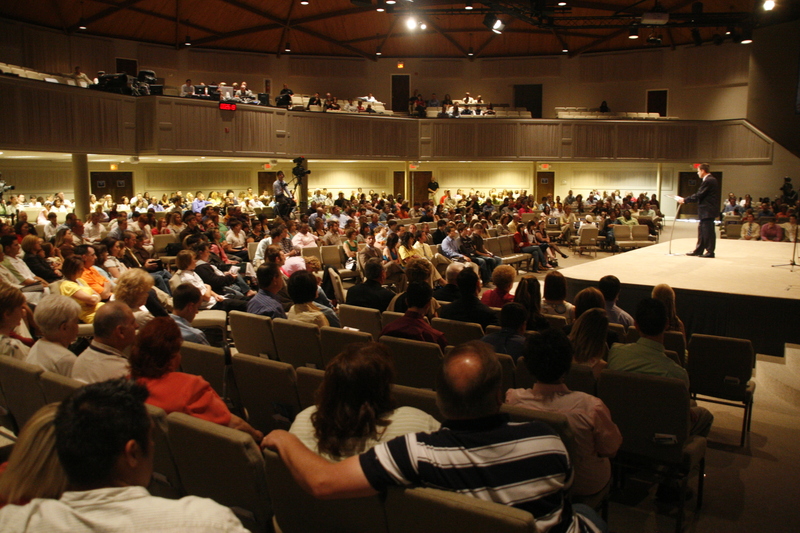 The preacher is separated from the congregation by space and usually height. 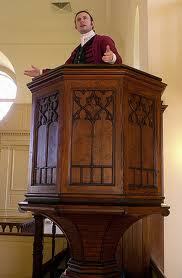 His pulpit is elevated above the passive people in the pews. No one can ask questions. It is inconvenient, out of place and considered a rude interruption. Instead of the congregation being actively involved, it sits passively and motionless, thus stagnating spiritual growth. In addition, the sermon makes the preacher the religious specialist and confirms the unbiblical role of the “clergy”. How can a Christian passively sit in a pew and affirm the priesthood of all believers when he is passively sitting in a pew? How can a Protestant Christian claim sola Scriptura (‘by the Scripture only’) and still support the pulpit Sermon? Nowhere in the Bible does God make provision for His followers to come together in a building built solely for worship “services”, to hear a “sermon” preached. The word “church” translated is ecclesia literally means the “called ones”. To the ears of a first-century Christian, calling a building an ecclesia (church) would be likening a person to a stone. Clement of Alexandria (150-215) is the first person to use the phrase ‘go to church’ —which was a foreign thought to the first century believers. You cannot go to something you are! Church buildings began with Constantine. In A.D. 312, Constantine became Caesar of the Western Empire. By 324, he became Emperor of the entire Roman Empire. Shortly afterward, he began ordering the construction of church buildings. He did so to promote the popularity and acceptance of Christianity. The thought was that if Christians had their own sacred buildings—as did the Jews and the pagans—their faith would be regarded as legitimate. 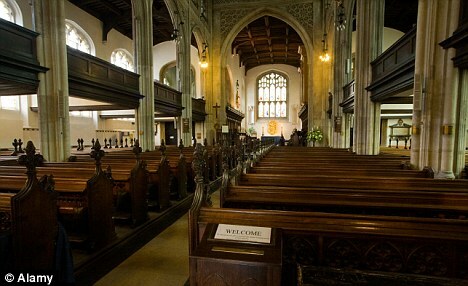 The church building brought significant changes to Christian worship. Because the Emperor was the number one ‘lay-person’ in the church, a simple ceremony was not sufficient. In order to honor him, the pomp and ritual of the imperial court was adopted into the Christian liturgy. Fourth century Christianity was being profoundly shaped by Greek paganism and Roman Imperialism. The upshot of it all was that there was an immediate loss of intimacy and open participation. The professional clergy performed the acts of worship while the laity looked on as spectators. Will you continue in what you know is not of God or will you stop and allow God to lead you by His word into His way for you? This entry was posted in Church and tagged Church Building, Protestant, Sermon, Service, Worship. Bookmark the permalink.